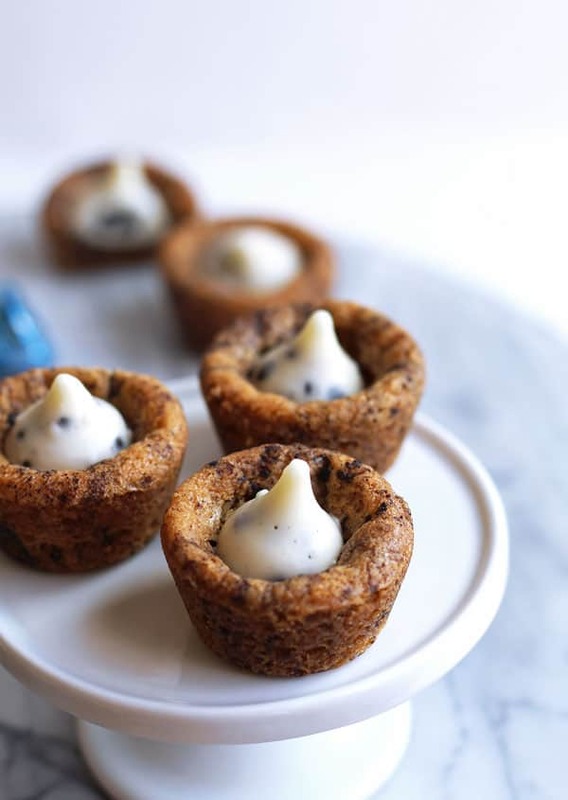 These Cookies and Cream Cookie Cups consists of Oreo cookie dough baked into bite-sized cookie cups with a Cookies and Cream Hershey kiss on top! It seems hard to believe but today there are exactly 6 weeks left until our baby girl’s (!) due date. Yes, I think I haven’t told you yet, but we are having a little baby girl! And are both super excited about it. Konrad already loves to talk about ‘his girls’ – baby girl and me that is 😉 I think it’s so cute… And WOW. I am so excited. Nervous, sure, but mostly excited. I can’t wait to welcome her into our family! She is already waaayy bigger than in this ultrasound picture from February. 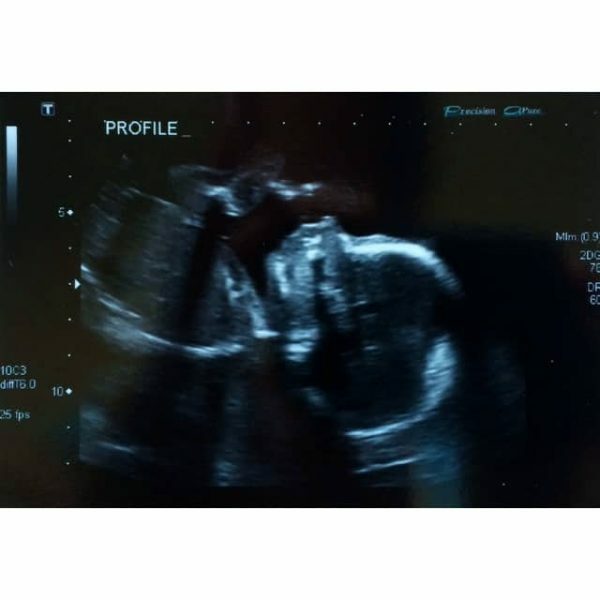 We got to see her progress in another ultrasound a couple of weeks ago but she didn’t want to give us a good look at her profile. On one hand, like I said, we are super excited to meet and hold and cuddle with our little baby girl, but on the other hand, ONLY 6 MORE WEEKS!! Not feeling quite ready yet. 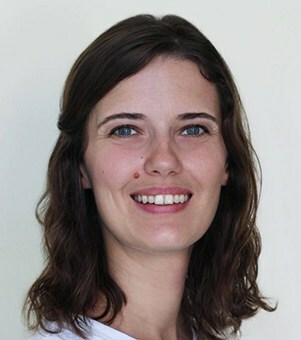 Sure, I wouldn’t mind getting rid of all the little pregnancy aches and pains – but aside from a really crappy first trimester, things are actually going really well. This past weekend, we finally started tackling the spare room that was housing the last few boxes we never got to unpack since moving into this place in February. We finally realized the key to apartment living – shelving! Another trip to Ikea later and things are starting to look a lot homier. And there are only a couple more boxes to sort through before we can put up the crib. We aren’t in too big a hurry though, since we plan on having baby girl in a bassinet in our room for the first few months anyway. I think this is the only way to have success with this thing called breastfeeding and to stay partially sane – apparently babies eat something like every 2 hours in the beginning!? Even at night! 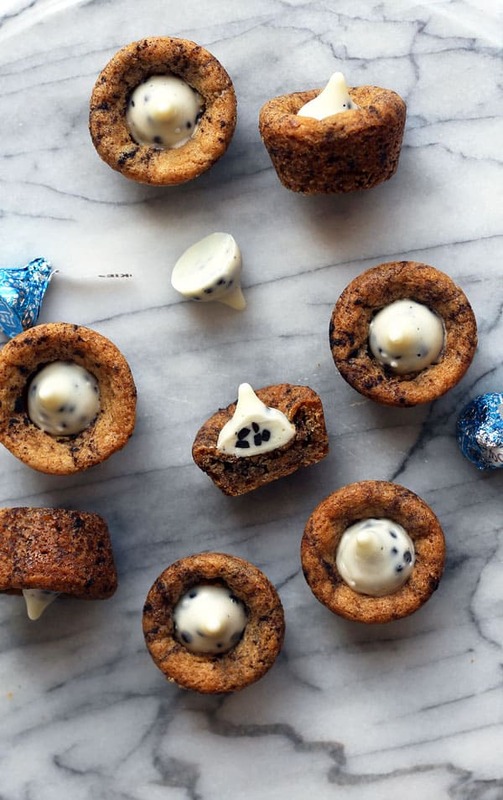 These Cookies and Cream Cookie Cups are perfect snack food. 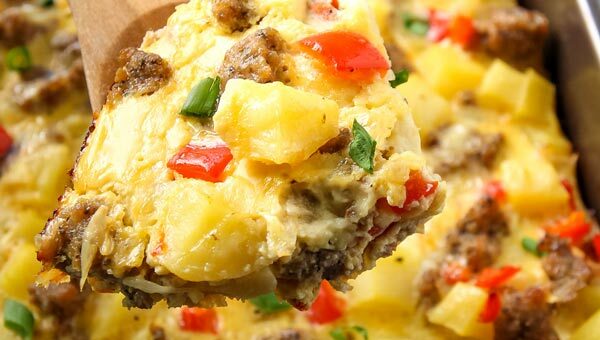 Since they are only bite-sized (okay, maybe 2 bites), they are perfect for portion-control. If you can keep yourself from popping one after the other, that is. Easier said than done. 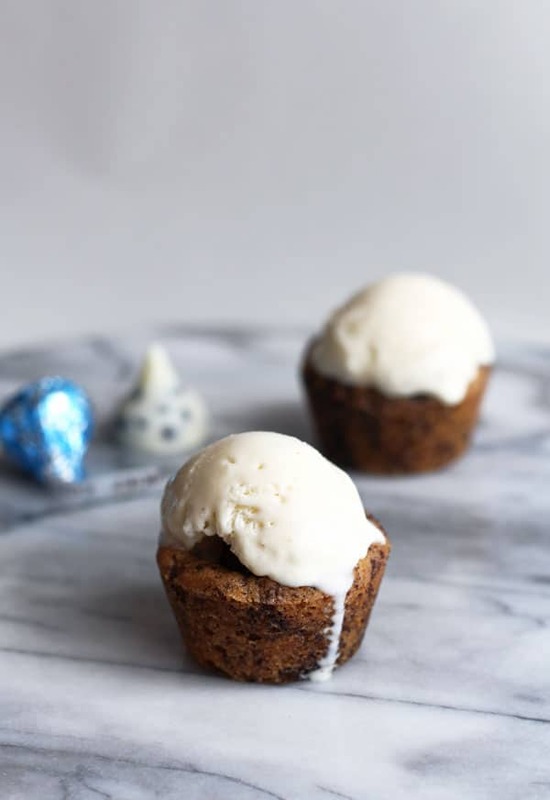 And, if, like me, you end up with more cookie cups than Hershey kisses, they also make a perfect cookie cone for just a mini scoop of freshly churned ice cream. Learn the best way to make homemade ice cream here. 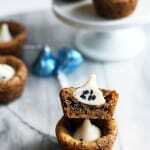 These Cookies and Cream Cookie Cups consists of Oreo cookie dough baked into bite-sized cookie cups with a Cookies and Cream Hershey kiss on top. Perfect! Cream softened butter with sugars, egg and vanilla until light (at least 1 minute). Whisk together flour, cornstarch, baking soda and salt. 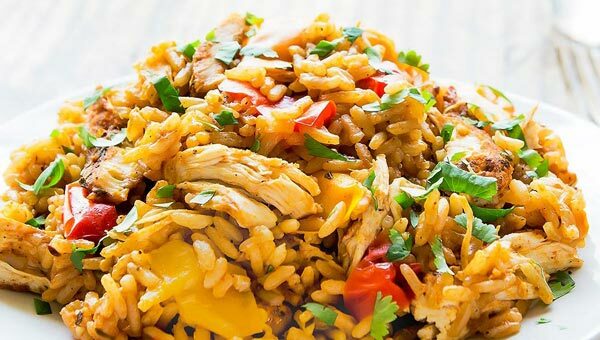 Add dry ingredients to wet and stir to combine. Stir in Oreo crumbs. Preheat your oven to 350 F. Grease a mini cupcake pan. 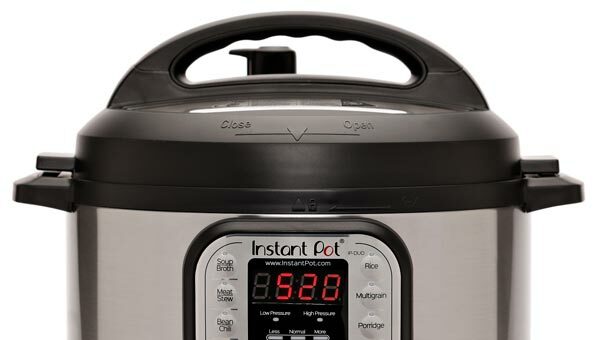 Divide dough evenly into cavities (no more than half to 3/4 full) and bake for about 8-10 minutes. 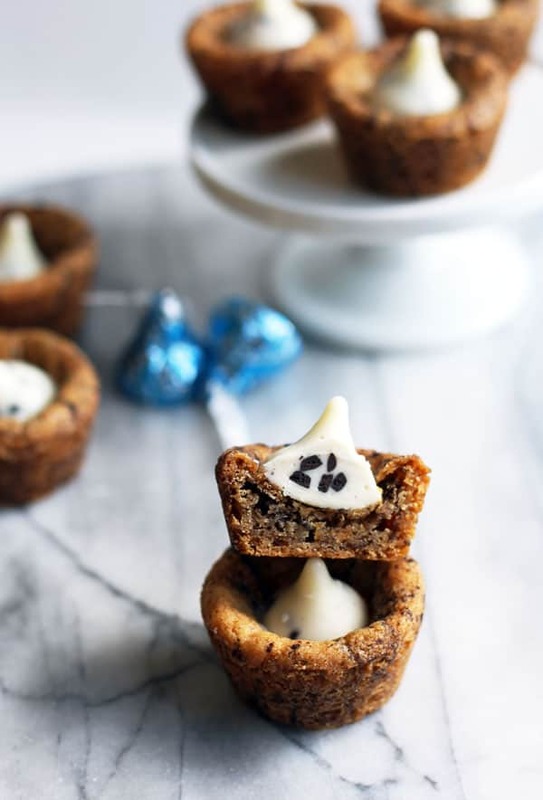 Remove pan from oven and top each cookie cup with a Cookies and Cream Hershey Kiss. Leave in pan until fully cooled and Hershey Kiss has set. Store airtight. Those cookie cups look really super. Wow, how quickly the time has flown…and a little girl!! 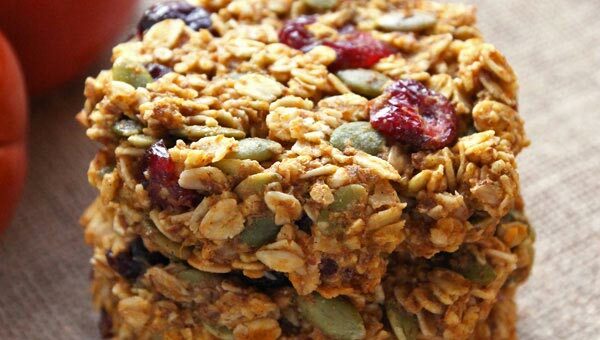 These look super YUM!! CONGRATS ON THE BABY GIRL!!! And yay for only having 6 weeks left! I hope everything continues to go well. These look sooo good. I don’t think I’d actually be able to keep enough Hershey’s kisses for the cups…so naturally they’d all just have to be filled with ice cream. Or both! These sound so good! Cant wait to try them!